The Buenos Aires 2018 Youth Olympic Games now less than one month distant, the young man on duty for Egypt will be Youssef Abdel-Aziz; on Friday 7th September at the 2018 ITTF-African Championships in Port Louis, Mauritius, the 18 year old was very much centre stage. Partnering colleague, Khalid Assar, contrary to expectations, the duo reserved their place in the final of the Men’s Doubles event and in so doing extracted an air of revenge. Two days earlier Egypt had lost to Nigeria in the final of the Men’s Team event; two days later the tables were turned. 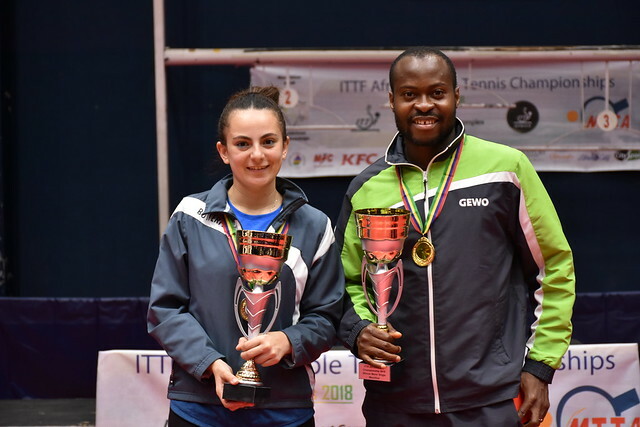 At the semi-final stage of the Men’s Doubles competition, Youssef Abdel-Aziz and Khalid Assar, the no.3 seeds, beat Quadri Aruna and Segun Toriola, the top seeds and moreover, the players who had remained unbeaten in the Men’s Team title decider to secure gold for Nigeria. The Egyptian duo emerged successful in six games (4-11, 14-12, 10-12, 11-4, 11-6, 11-5). Impressive from Youssef Abdel-Aziz and Khalid Assar, it had been exactly the same en route to the final; in their opening contest they had beaten Gabon’s Andy Bringaud and Wilfreed Nguema Mivey (11-2, 12-10, 11-4), before in the quarter-finals, the stage at which matches became best of seven games as opposed to best of five games, they ousted the host nation’s Allan Arnachellum and Brian Yook Foo (11-9, 13-11, 11-5, 13-11). In the final, colleagues Mohamed El-Beiali and Ahmed Ali Saleh, the no.2 seeds, await; they progressed to the final in a most authoritative manner, like their compatriots ending Nigerian hopes. After accounting for Angola’s Elizandro André and Alessio Antonio (11-6, 11-4 11-2), they beat Bode Abiodun and Olajide Omotayo (8-11, 11-6, 12-10, 11-2, 11-7) to reserve their place in the penultimate round where they overcame unexpected semi-finalists, the Ivory Coast’s Kanate Ali and Oba Kizito Oba (11-6, 11-7, 11-2, 12-10). Notably at the quarter-final stage Kanate Ali and Oba Kizito Oba had beaten South Africa’s Theo Cogill and Shane Overmeyer (11-7, 10-12, 13-11, 8-11, 12-10, 11-7), the surprise second round winners in opposition to Algeria’s Larbi Bouriah and Sami Kherouf, the no.4 seeds (11-7, 4-11, 11-7, 11-6). The final of the Men’s Doubles event will be played on the evening of Saturday 8th September.